Very rare Superman''muscle tunic'' worn by Christopher Reeve during filming of''Superman: The Movie'', the very first film of the beloved Christopher Reeve franchise, released in 1978. Tunic used in the flight scenes features two stitched holes on the sides, used to attach the flying harness. Four snaps at top are for attaching the cape. 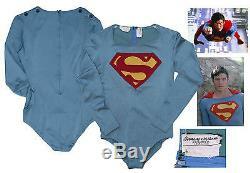 Signature blue tunic is made complete with Superman's large emblematic gold and red''S'' sewn onto the front. The original''Bermans & Nathans / 40 Camden St. 1'' tag is still intact on the tunic's inner back collar, next to the zipper, with the label reading in type:''CHRISTOPHER REEVE / 12312 WITH MUSCLES / SUPERMAN''. Made of special nylon fabric, used for its stretch and ability to retain its original shape. Without being stretched, tunic measures 18'' across the chest and 29'' long. A few small holes, otherwise in near fine condition. The item "Christopher Reeve Superman Hero Costume Prop Store COA" is in sale since Saturday, September 30, 2017. This item is in the category "Entertainment Memorabilia\Movie Memorabilia\Wardrobe\Originals".